The Filipin-Oz website is an offshoot of the Filipino Directory. We focus on issues affecting the Filipino community in Australia and on stories of Filipinos who inspire and are worthy of emulating. Our aim is to rightly inform the community and provide the facts behind the story. We also capture stories from back home affecting Filipinos in Australia and around the globe. About the Publisher/Editor: Miss Benjie de Ubago, PR/advertising consultant. She runs her own advertising/public relations consultancy, Ideas for Sale. She is an alumna of University of Santo Tomas, Philippines. She is also a regular columnist for the Filipino newspapers, which she does as a community service and is an active member of the community. She arrived in Australia in 1971. Guest writer include: Deanna Tamayan. Contributors are welcome but the editor reserves the right to edit or refuse publishing if it does not comply with the standards of Filipin-Oz. For more information and for contribution, contact: ideas@ideasforsale.com or phone us on 0412 966 300 (for overseas +61412 966 300). 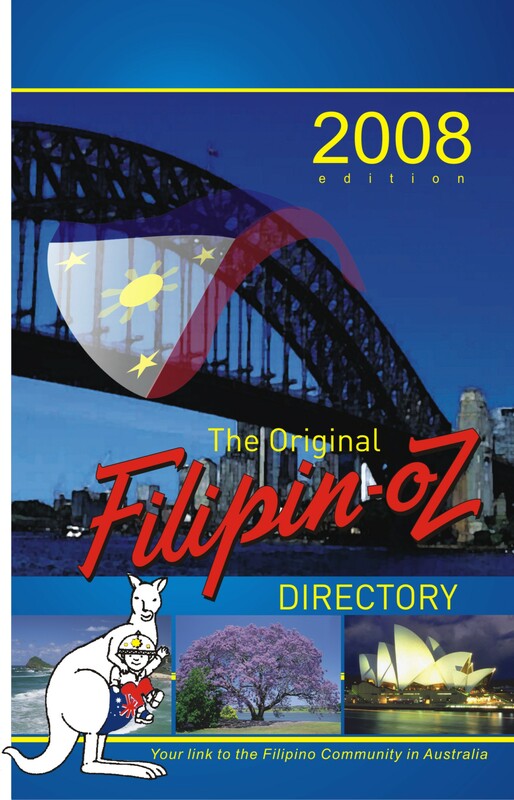 The Filipin-Oz Directory was first released in 1987 and is the only Directory of the Filipino Community in Australia. The 2008 edition includes over 1000 listings of community organizations and Filipino-owned businesses. The Filipin-Oz Directory provides a much important link to the growing Filipino community and is of significant value to anyone with a special interest in the Philippines and/or vice versa. The publication is a handy A5 size has become the “bible” of the community and is the link to the Filipino community in Australia. For Filipinos, the Directory connects them with Filipinos around Australia; assists in the assimilation process; and gives them an overview of places to visit in the Philippines. For Australians, the Directory gives them an insight of the community and is essential for anyone wanting to reach the community. Also included in the 2008 edition of the directory is the “pioneering spirits” section which identifies the early Filipino settlers in Australia in the sixties and the seventies who helped shape the community. All contents and photos are subject to copyright. To get listed in the next edition, please click on “Directory” and fill in the form provided.